When you head to the Nilgiris, you think of landscaped tea gardens, curvy roads, and heritage British bungalows. Your weekend getaway needs to be nested inside nature providing you with tranquility, relaxation, and rejuvenation. One such trip took us to Tea Nest which is part of Nature Resorts’ many properties in the Nilgiris. Ooty can become a disappointment! Overcrowded streets, traffic, and crumbling infrastructure is a concern in Ooty, therefore we prefer traveling to Coonoor instead. Therefore, while researching for a hotel in Coonoor, we stumbled upon 4 properties from Nature Resorts group! Tea Nest is a cute little resort nestled in the massive 1000 acre Singara Estate. It is a colonial-era British styled bungalow, overlooking the Nilgiri mountains with a panoramic view of Mettupalayam city. Landscaped gardens, tall pine trees in the courtyard with tea estates all around. This is what makes Tea Nest one of the most scenic properties near Coonoor. Tucked away in the middle of endless hills covered with tea plantations in the outskirts of Coonoor, Tea Nest is an ultimate retreat for someone who is willing to spend a few quiet days away from the hustle-bustle of the city life. Everything at the Tea Nest revolves around the concept of tea. The cozy rooms are named after different flavors of tea, and the in-house restaurant serves a tea-infused special menu for its guests! 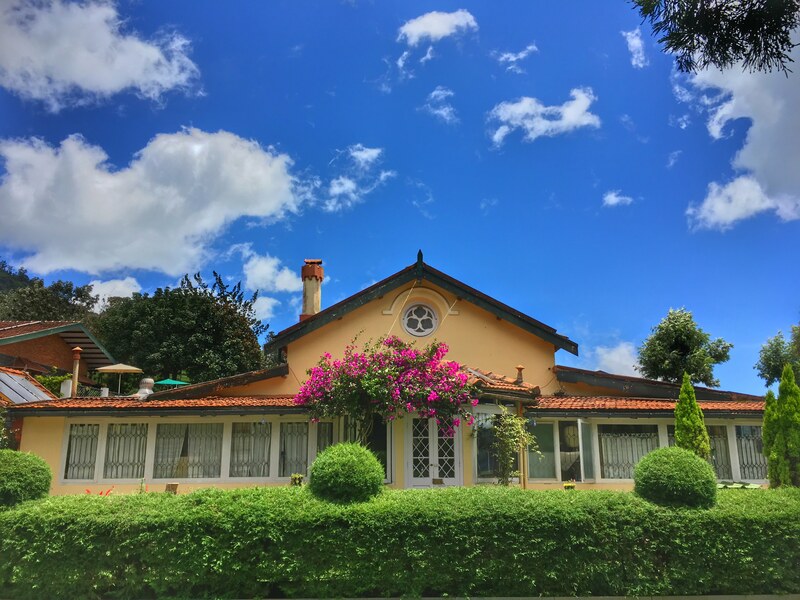 The stately mansion built in the 1800s was home to a British Aristocrat and then a tea school until the Nature Resorts took it over and transformed it into a budget homestay. The mansion is located on the slope of a hill in the Singara Tea Estate. Therefore it offers a panoramic view of the tea estate surrounding it on all four sides. Based on the concept of tea, there are 6 rooms namely lemon, green, silver tips, golden tips, chamomile, jasmine: all are names of different teas grown in the Nilgiris. There is a large sitting room with a cozy fireplace in each room which provides a quiet escape to read or play board games. Surrounded by tea gardens on all four sides, the resort offers stunning and uninterrupted views of a forest on one side. We were also treated to a tea tasting session. As a guest, you can experience this exclusive session delivered by highly qualified tea tasters of the region. The staff took us through the process of brewing different types of tea. The session included some interesting snippets about how some of the rare Nilgiri tea brands originated. We went through varieties such as Frost Tea, Organic Green Tea, Golden Tips, and White Tea with the last one being our personal favorite. Our days we spent walking around the estate, cycling with the clouds or talking to the helpful staff who had many stories to share. They are very friendly, always eager to serve and cook yummy food! Tea Nest is a lovely place for those who connect with nature, love the outdoors and are looking for tranquility. Where else would you witness a lush green carpet of tea estate right outside your window or the majestic movements of floating clouds over the Nilgiris? True…. I had been to ooty couple of times just for long drive sake… l was not happy at all cos of over crowd. This article making me enthusiastic to drive towards Tea nest, in between tea estate..